The Writing Bug: NCW and You: We Did It! Actually, You Did It! NCW and You: We Did It! Actually, You Did It! Ladies and gentlemen, you did it! 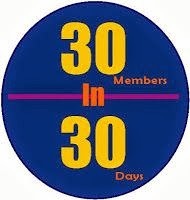 You helped Northern Colorado Writers reach and its 30 Members in 30 Days goal. In fact, we were several new memberships, upgrades, and renewals over our minimum. It's like Christmas, except in a more non-denominational, non-capitalistic way. Of course, there are many people to thank in this effort. Johnny: Well, Rich, I did all I could in my capacity as game show announcer. Johnny: No need to hold back. I can be as humble as the next extremely talented and good looking individual. Johnny: Well, Rich, my over-sized brain tells me it's the truth. We wouldn't have reached our goal. This means the 7th year of Northern Colorado Writers will be even greater than before. Johnny: Especially with me announcing all of the upcoming events. There. Are. No. Game. Shows. Johnny: Then, why am I here? I believe to bother me. Johnny: Well, Rich, that truly hurts. Johnny: I'm taking away your lifetime supply of Palmolive. Now your hands won't soften while you do the dishes. Let me make it up to you. The end of the membership campaign doesn't mean people can't join NCW during the rest of the year. Johnny, tell them about some of the stuff we talked about over the last month. Johnny: Well, Rich, here's what we touched upon. How NCW helped achieve your writing goals. The ways you can be a part of NCW. Testimonials from current NCW members. A photo of Rich dressed as a woman during his Sophomore year in college. Johnny: I see. You're taking Rice-a-Roni and York Peppermint Patties out of my family's mouth. What am I going to tell Johnny Jr. about this? Johnny Jr.: Well, Pop, is that the poopie head who's harassed you over the last few weeks? Johnny: Yes, son, that's the mean man. Johnny Jr.: Want me to cut him? Folks, continue supporting Northern Colorado Writers by reading this blog and joining the organization. And try to do it before Johnny Jr. decides to cut an important organ out of my body. Johnny Jr.: Should I start with the pancreas, dad? Johnny: It's the San Francisco treat. Yes, thanks for all your help, Johnny. I mean it.